Taken place on September 15, 2009. I felt compelled for a few years to try The Modern‘s tasting menu, after seeing Ulterior Epicure’s gorgeous photos of his experience and hearing it from a friend who did enjoy his dinner thoroughly for week before I went, I thought it’s about time to give it a whirl and go there. 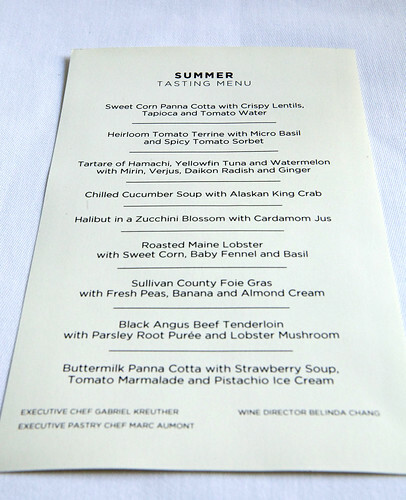 And as you read from the title, I had the tasting menu (the mid-summer seasonal tasting menu). The captain gave me a copy to follow along this meal. Bread service was simple; a choice of a mini olive baguette (which I chose) or a mini french baguette and of course, butter. 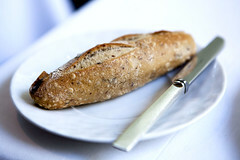 The olive baguette was served warm. It’s not too crusty and it has enough chew. The butter was at the soft, spreadable creamy stage that every butter served should be. Then the servers brought out the canapes and toasted fava beans. The canapes were consisted of large serving spoons of a tartare of red snapper, sesame oil with sea beans and savory palmiers. 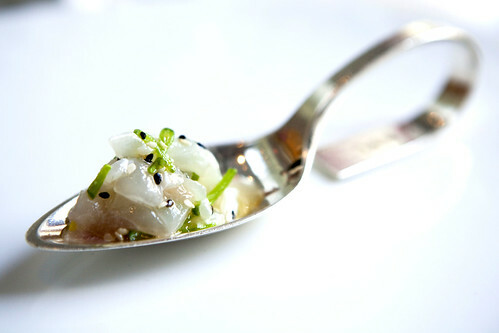 At first whiff, I can smell the intense sesame oil of the tartare. I think the sashimi was quite flat in terms of flavor. All I got was silky fish and sesame. The sea beans’ flavor was masked by the oil. The positive thing was the superb grade of fish. The palmiers were good but nothing extraordinary to mention. 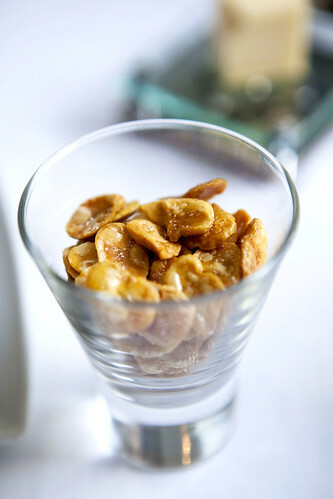 I would consider the toasted fava beans as an upscale version of roasted peanuts in a bar. It’s very easy to keep reaching in to snack. 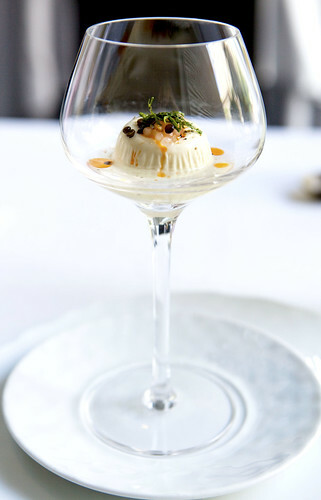 The amuse of sweet corn panna cotta with crispy lentils, tapioca and tomato water was served elegantly in a wine goblet. The panna cotta was true to its textural form (creamy and smooth without being too gelatinous) and it’s delicately sweet. The lentils and tapioca added the crunch and chewiness to the party and the tomato water added some acidity to this amuse. Moving onto bolder flavor territory, the heirloom tomato terrine with micro basil and spicy tomato sorbet was intensely the tomato-y were and the variation of the prep from room temperature to frozen was interesting. 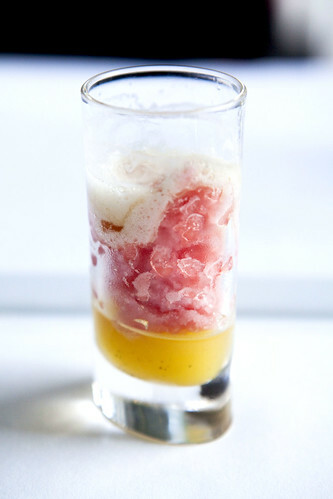 The sorbet was quite a wake up call to my palate bringing flavor punches of sweet, acidic and spicy. The tartare of hamachi, yellowfin tuna and watermelon with mirin, verjus, daikon radish and ginger was everything I love about tartare and some unexpected elements that I would never thought it would go well. 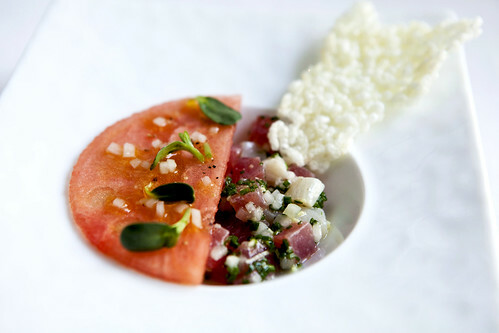 The hamachi and yellowfin tuna tartare was light, refreshing and savory, while the thin slice of watermelon made the dish a touch sweeter and amplified the refreshing element. 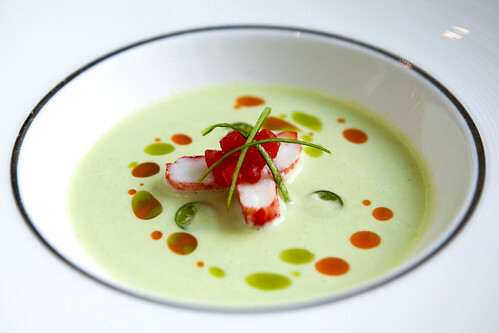 The chilled cucumber soup with Alaskan King crab was creamy and subtly sweet soup. The cucumber flavor was very subtle. When eaten with a bit of crab, the sweetness intensifies and it adds some chewy texture (in a good way) to the soup. The halibut in zucchini blossom with cardamom jus was beautifully plated, especially the halibut wrapped in the zucchini blossom. The delicate flavors of the fish with the blossom and the ribbons of zucchini almost acted like a pasta to this dish. 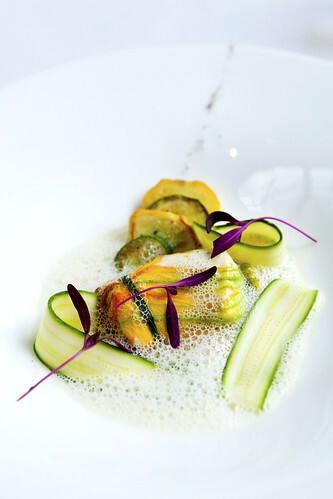 The cardamom jus imparted a gentle floral spice flavor to accompany the zucchini blossom’s flavor. 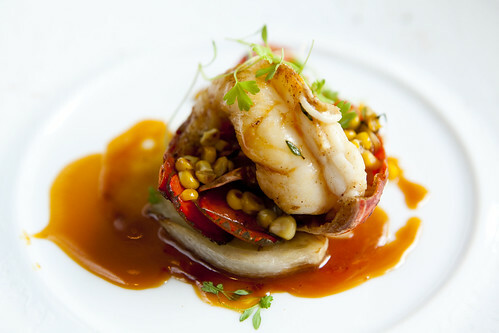 The roasted Maine lobster with sweet corn, baby fennel, and basil was perfectly cooked and tasty. But combining the corn with lobster seemed a little dissonant to my palate. I understand the sweet factor that’s played along this meal but it doesn’t work for me since the sauce was very robust and savory. The foie gras with fresh peas, banana, and almond cream was definitely the most unusual course of the ones I’ve tried so far. 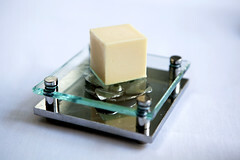 The foie gras was cooked in a sous vide instead of the traditional searing or pan-roasting. 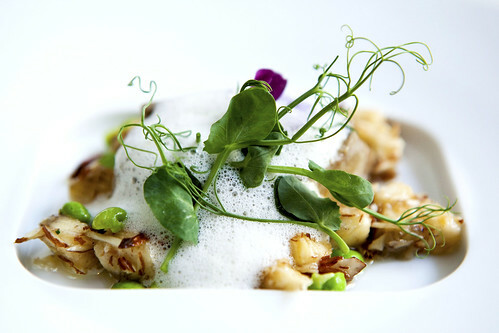 The combination of foie, peas, bananas, and almond cream isn’t something that I would ever imagine eating together. It actually works. Texturally speaking, it’s all pretty much soft, smooth and creamy. 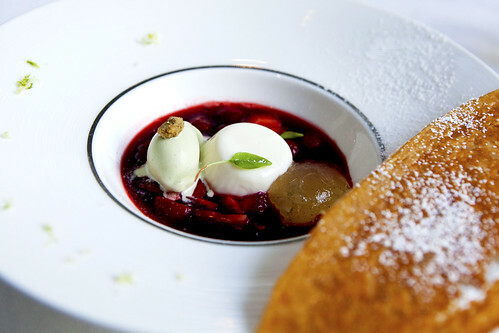 Flavors are all subtle and sweet with the touch of (good) liver funk from the foie gras. The Black Angus beef tenderloin was arguably the most simple dish. 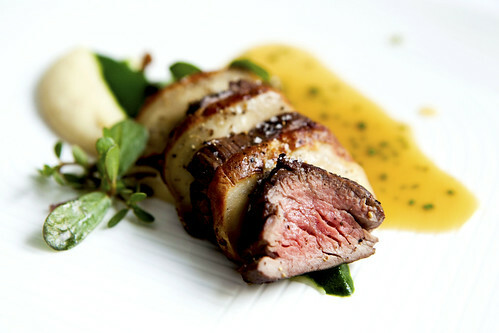 Super tender, seared tenderloin layered with sweet, meaty lobster mushrooms, sweet and savory parsley puree and shallot vinaigrette. Sweet jeebus, I was loving every bite of it. As a palate cleanser or pre-dessert was the pineapple gelee, watermelon granita and mint foam. This was served in a double shot glass, not a full sized dessert course. The pineapple and watermelon elements were great but the mint foam tasted too medicinal for me. According to my waitress, the mint flavor’s supposedly from a fisherman’s candy. Moving onto the actual dessert, buttermilk panna cotta with strawberry soup, tomato marmalade and pistachio ice cream served with a large, thin caramelized tuile was everything a strawberry lover would admire. The strawberry soup was intense and not too sweet. 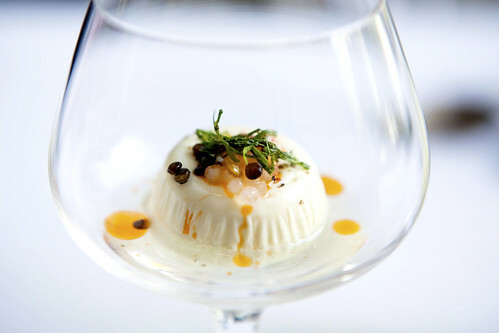 The buttermilk panna cotta was smooth and creamy just to add some texture to the soup and the tomato marmalade mimicked the tartness of strawberries. The pistachio ice cream was deliciously creamy. Then came the petit fours… First was the mini fromage blanc and raspberry ice cream cone with candied lime zest. 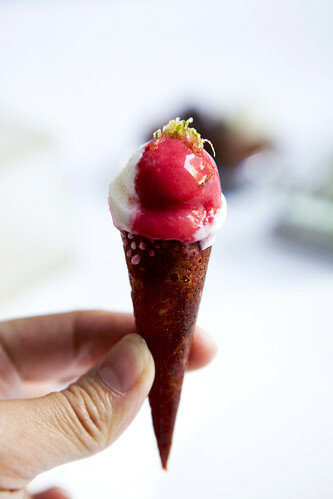 The cone portion was actually a tuile shaped as a cone. The fromage blanc and raspberry swirled ice cream was magnificent. It’s looks cute and dainty but it packs a wallop of flavor. I wouldn’t mind having a dozen of these for dessert instead. 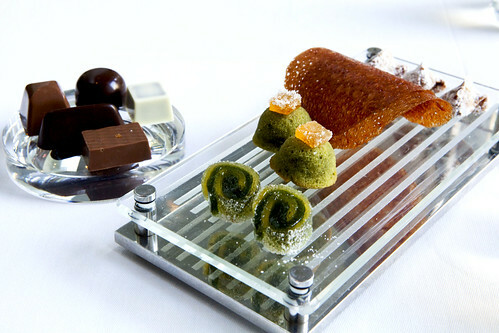 As for the second (or third) part of the petit fours, were a tray of gelees, tuiles, and amaretti cookies with a small assortment of chocolates (click on the above photo if you want to know what is on the tray). The most intriguing of the bunch was the lemon, pineapple and pepper gelee (sweet and pineapple-y then a spicy kick to the back of my throat). The chocolates were of top notch quality (and I liked them equally). Once I’ve finished my long meal (that took me almost 2 1/2 hours(?!)) I dragged my very full and content self out of the restaurant. Was it worth the price tag? Yes. 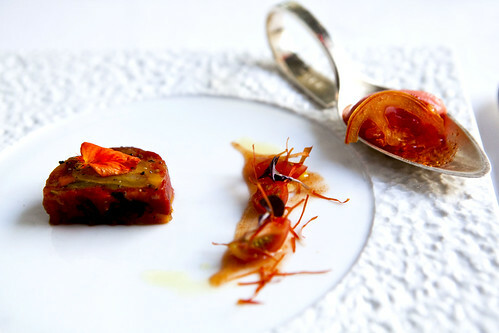 Would I go back for another round of this tasting menu? Maybe. It’s more of a special occasion or business schmoozing meal because of the price tag (obviously) and the decor and restaurant itself leans toward the upscale elegance that isn’t meant for a casual meal. These photos are stunning! 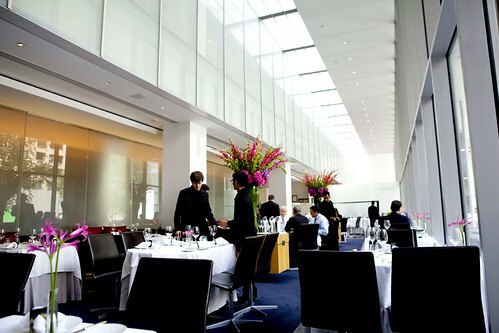 You can see the similar sensibility to Eleven Madison for certain.